Clifton Antiquarian Club is based in Bristol, although members are distributed across the southern half of England and Wales. We seek to promote a better understanding of our archaeological heritage and meet on several occasions during the year for lectures, tours and research projects. Please feel free to contact us if you have any queries or are interested in getting involved. On May 18th we are due to start an excavation on L’Ancresse Common in Guernsey to investigate some round mounds that may be prehistoric. We will keep you informed. 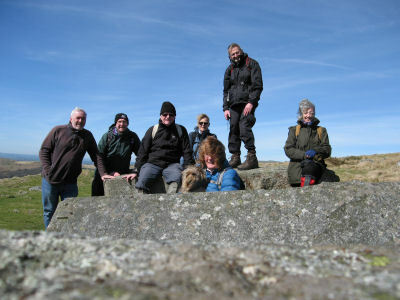 We are planning Lansdown lectures, day trips, overnight excursions and our trip abroad. Keep an eye on the website and calendar for further details. 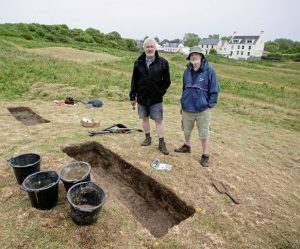 In excavations kindly sponsored by the Vale Commons Council in Guernsey, Clifton Antiquarian Club have been investigating some interesting earthworks in the north of the island. The results look promising and could lead to more work in 2019! Le Trépied the Oldest Channel Island Passage Grave! In the May 2017 excavation we obtained samples of charcoal that have enabled us to establish the the construction and use phases of the monument. Read our Press Release here!